So now you’ve got your website up and running and you need to move the needle on those traffic stats. What steps can you follow to make sure you start getting traffic and ensure it increases in a consistent manner? If you’ve followed these best practices to give your new business website a head start, you will have understood how important it is to consistently publish new content on your website. 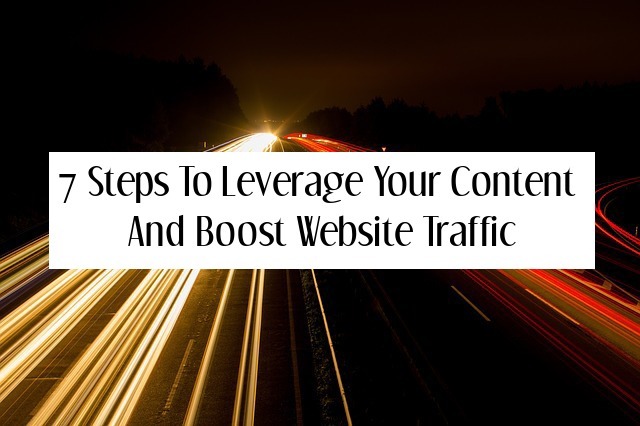 Here are six steps to leverage your content to bring in new website visitors. The best way to publish new content regularly on your website is with a blog. Blogs are natural search engine magnets and help your content get better rankings in search engines. They are easy to optimize and update. Follow these tips on how to optimize your blog for search engines and you’ll be off to a great start. Find long-tail keywords you can rank for easily and create content around them. It goes without saying that the content you create must be related to the theme of your blog and must interest the audience you want to attract. It’s no use attracting traffic to your website if it’s not the kind of traffic that will further your business goals. Write lots of evergreen content – that is, content that is always relevant to your audience, no matter how old it is. Make sure that your content addresses your prospect’s problems and pain points. Content that is useful, answers common queries and offers solutions that makes people’s lives easier is always in demand, and will get traffic for years to come. Social shares are a huge ranking factor for search engines in 2015. The more shares your blog posts get, the better they will rank. Remember to share every one of your posts on your own social profiles. You can increase your social shares using Facebook’s Promoted Posts option that allows you to boost your post for a budget that you set. You can also give your evergreen content a new lease of life using a WordPress plugin called Revive Old Post. It will allow you to boost your social shares for the same content again and again. Syndicate your content to sites like Business2Community that have a massive audience and will share your blog with their community of readers and subscribers. This will help your content reach many more people than you could otherwise reach from your own blog, especially when you’re just starting out. Don’t forget to link back to your blog in every post, so that you get backlinks as well as potential traffic, from your syndicated post. Also repost your blog content on LinkedIn. It will help build a following and boost your credibility among your LinkedIn community. Find other blogs that cater to the audience you’re looking to attract. Make sure these guest blogs have a large number of subscribers and will give you a link back to your blog. Be selective about guest blogging, though, because it is one of the content marketing strategies that has been overused and abused by bloggers and Google does not view it as favourably as it used to. Don’t get discouraged if your posts don’t get as many shares as other blogs in your niche. It takes time and consistency to build traffic using content marketing. If you target your keywords well and get a high-ranking for many of those keywords in Google and other search engines, you will definitely get traffic from search engines, even if you don’t get a lot of social traffic. Post quality content on a consistent basis and leverage your content using the content strategy above, and you’ll get high rankings for many of your long-tail keywords and boost your website traffic for years to come. Do You Need A Rainbow In Content Marketing?